A few years ago I created a package of very interesting maps under contract to the University of Ottawa. The research question was simple: how far do women travel to access abortion services in Canada? The data had been collected using a voluntary survey in partnership with several clinics across the country and each women had recorded home postal code or city name. My job was to match up the origins and destinations, aggregate the data to protect individuals privacy, and analyze the socioeconomic patterns in the data. These maps have now been published in the Women’s Studies International Forum. Here is one map from the paper. I also created several detailed regional views featuring proportional symbols to illustrate the number of women travelling from each origin census subdivision. Access to abortion services is uneven throughout Canada. As a result, women cross provincial and territorial borders to garner access to abortion services. 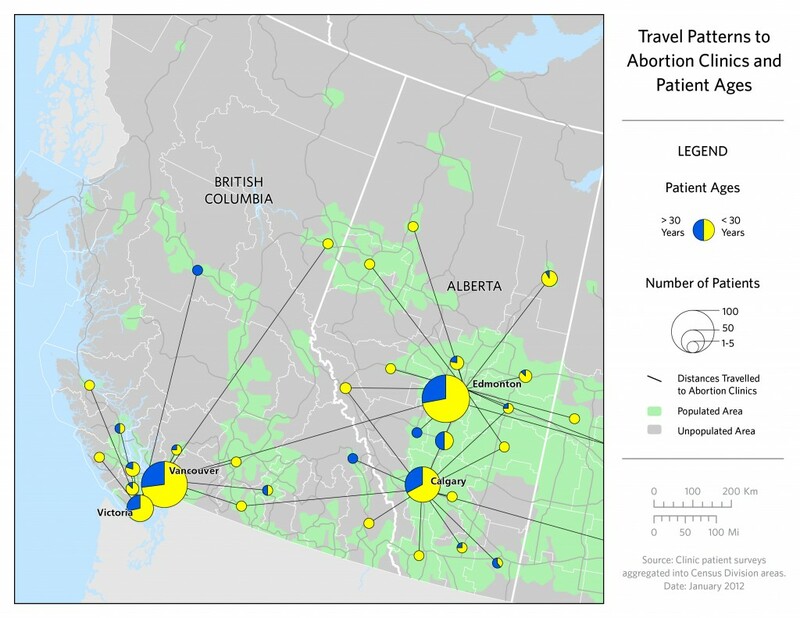 In this first-time study, the travel women undertake to access abortion services at freestanding clinics across the country was systematically tracked, mapped, and analyzed using questionnaire-based data. A total of 1186 women from 17 freestanding abortion clinics provided information about their journeys. 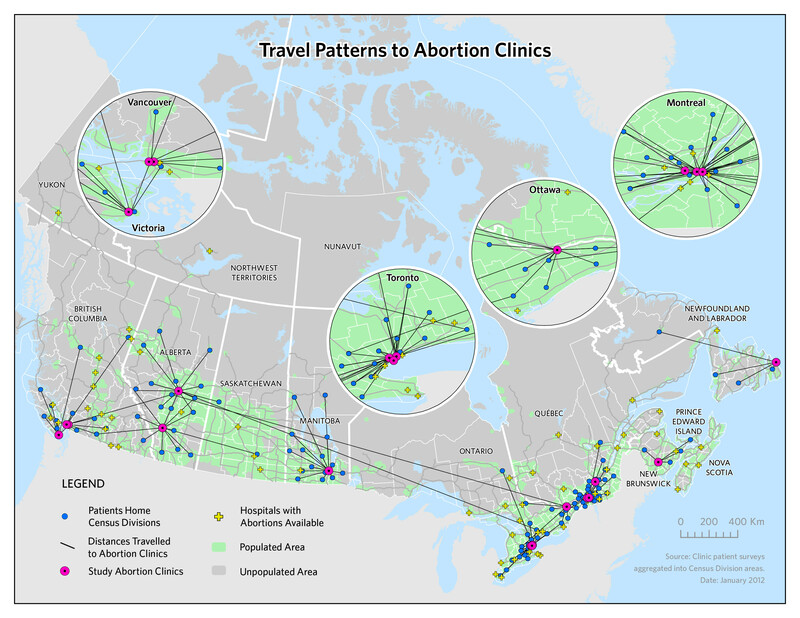 The mapped data reflect the acknowledged importance of the “spatial turn” in the health sciences and provide a graphic illustration of spatial disparities in abortion access in Canada, namely: 1) the paucity of services outside urban centers; 2) the existence of substantial access gaps, particularly for women living in Atlantic, Northern and coastal communities; 3) the burdensome costs of travel and, in some cases, the costs of the abortion procedure itself, especially for younger women who travel the farthest; 4) the unique challenges First Nations and Métis women face in accessing abortion services. This entry was posted in Analysis, Data Visualization, Public Health. Bookmark the permalink. Very well done & very interesting. Thank you for sharing.